Is a license required to sell a franchise in Utah? The states vary from requiring extremely detailed applications to requiring a simple registration for Franchise requirements. In Utah, anyone who sells or offers to sell business opportunities must comply with their Business Opportunity Disclosure Act. Sellers of business opportunities are required to file with the Division of Consumer Protection (the Division) the information that is required under Utah Code and receive from the division proof of filing. If you as a franchisor are in compliance with Federal Trade Commission (FTC) rules then you are exempt from filing with the Division, however, instead of filing disclosure documents you must file a notice of exemption stating that you are in substantial compliance with the requirements of the FTC. If you sell a franchise in the state without filing the required information you could be subject to a statutory fine of $2,500 for each violation of the statute. In addition you would be subject to an order to cease and desist if you do not file the required information within 15 days of receiving written demand. If you violate this order you will be subject to a $5,000 fine for each violation. If you fail to provide information in a single disclosure statement to a purchaser at least 10 days prior to execution of the franchise agreement, the purchaser is entitled to rescind the agreement, to an award of attorney fees and a judgment for the amount of the greater of $2,000 or actual damages. This process can be very confusing and the penalties for non compliance are harsh. 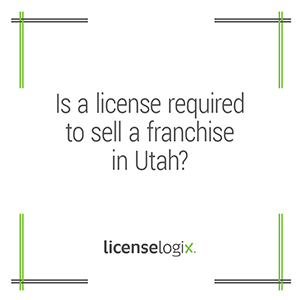 LicenseLogix can help you by researching your specific franchise’s requirements, and compiling a research packet with all of the information you need to start selling in Utah. Further, if you do not want to deal with the hassle of submitting applications LicenseLogix can complete all the applications for you and streamline the process. The pricing for our services vary depending on the extent of services you wish LicenseLogix to perform. For more information on how we can streamline the process of business licensing, you can contact us by clicking live chat function, submitting a question to our licensing team or simply call us at (800) 292-0909.